A number of US giant energy corporations have expressed their interest in investing in Vietnam’s energy sector which is projected to double in size in the next two decades. At a meeting between the US-ASEAN Business Council (USABC) held in Washington D.C and Vietnamese government officials, representatives from four US-based energy giants namely ExxonMobil, AES, Cheniere Energy, and Energy Capital Vietnam said that there remain a lot of opportunities to invest in this sector in the context of rising energy consumption required for the fast-growing economy. The energy firms showed their eagerness after Vietnamese Deputy Minister of Industry and Trade Dang Hoang An said that the ministry will soon develop a power generation map that focuses on using energy liquefied natural gas (LNG) as supplied by US firms. The planning will offer opportunities for US firms which are able to supply LNG at competitive prices, stable supply, and suitable mechanism, An said at the USABC’s roundtable meeting. According to the Vietnamese government’s portal, Prime Minister Nguyen Xuan Phuc has asked authorized agencies to support ExxonMobil in petrochemical complex and offshore oil and gas projects, AES in Mong Duong Thermal Power Plant in the northern province of Quang Ninh, Energy Capital Vietnam (ECV) – a Vietnam-focused project development and asset management company in 3.2 GW semi-offshore power project in the central province of Quang Nam, and Cheniere Energy in seeking investment opportunities in the Southeast Asian country. Cheniere Enenrgy Inc. said it saw the market potential following the Vietnamese government’s plans to boost the use of LNG and renewable energy as Cheniere Enenrgy was the first US firm to export LNG in 2016. So far, it has shipped cargoes to 32 countries and Vietnam would be the next destination. The company can offer products in Vietnam at competitive prices, stable supply, and flexible sales. ExxonMobil and AES said they have witnessed Vietnam’s improved business environment over the past years as the government has been taking drastics measures to tackle problems and create favorable conditions for the investors. A joint venture between ExxonMobil and Vietnam National Oil and Gas Group (PetroVietnam) has advanced plans for the multi-billion dollar gas exploitation project off Vietnam’s central shore – Ca Voi Xanh (Blue Whale), which is Vietnam’s largest gas field discovered in 2011. “The Ca Voi Xanh project could bring a number of long-term benefits to the country, including cleaner, reliable power to help drive economic growth and improved living standards,” foreign media quoted President of ExxonMobil Development Company Liam Mallon as saying. David Lewis, CEO of Energy Capital Vietnam, earlier said on the firm's website that they are grateful for the support and assistance from the Vietnamese Ministry of Industry and Trade (MOIT) on this project which aims to bring LNG power to Vietnam in the most efficient and effective manner possible. Importing US-sourced LNG to Vietnam will bring Texas resources into a vibrant new marketplace and help reduce the trade deficit between the two countries, David Lewis said. David Lewis noted that ECV is able to mobilize private capital for energy projects in Vietnam. In turn, Minister - Head of the Government Office Mai Tien Dung said that Vietnam has prioritized the development of energy and sought for different solutions. That would be a great chance for investors, mainly those from the US, he said. To facilitate the investment, the Vietnamese government has removed hurdles and offered investment incentives in the energy sector, the Vietnamese official said. Alexander C. Feldman, president and CEO of the USABC, said that the Vietnamese government has been making better policies and offering improved business environment to welcome foreign investors, including those from the US. 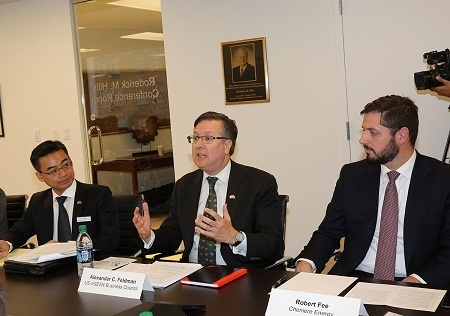 Earlier in March, 2019, the USABC and representatives from more than 50 US firms made a field visit to Vietnam, where they saw the Vietnamese government’s willingness to offer a good environment for the investors, Alexander C. Feldman said at the meeting. As of end 2018, Vietnam’s installed capacity reached 48,560MW. The annual energy growth varied between 10% in 2016-2020 and around 8% in the 2021-2030 period.